If someone mentioned the term “Cyber Security” you’d surely know more about this topic today more than ever before. That’s primarily because of all the media attention due to the large number of companies that have had sensitive data and information compromised during 2015 and its effect on millions and millions of individuals worldwide. We expect the institutions that we provide our most personal data to, in fact, keep it safe. Cyber Security is defined as 1: the protection of information systems from theft or damage to hardware, the software and to the information on them, as well as from disruption or misdirection of the services they provide. With that being said, having a well-defined cyber security strategy is essential for any CIO or CRO. In reality, it has become such a significant threat, that it’s now an issue that CEO’s, Boards of Directors and even central governments are playing a part in. So, if that’s the case, one might ask - why are there still so many information breaches occurring? 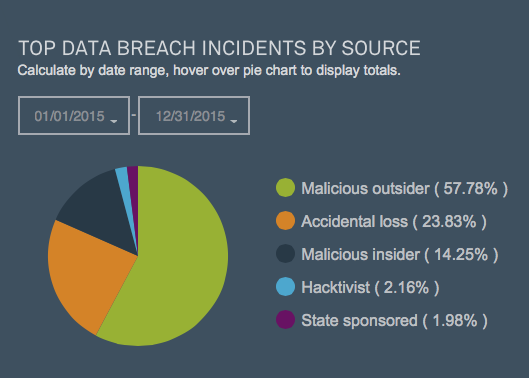 Before we attempt to answer that daunting question, let's take a few moments to review some of the most significant security incidents worldwide during 2015 2 . As you can see, the impact is significant to you and me. 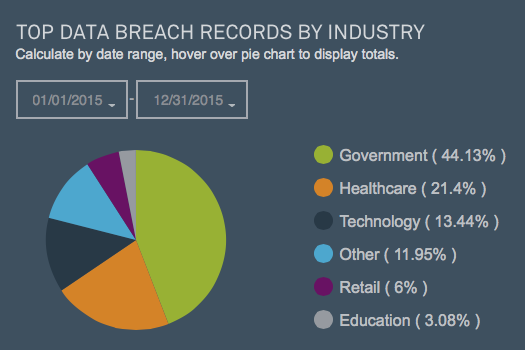 According to BreachLevelIndex.com, there were 628 Million records breached in 1,857 unique events during 2015, which is an increase of 138 events over 2014. Most of these incidents were classified as a “Malicious Outsider” event and with most of them occurring in the government and healthcare sectors. The events of the previous year are far-reaching in many countries and business sectors. My prediction for 2016 is that I do not see this trend slowing down or leveling off, and genuinely, I expect it to get worse as the year progresses. This is, perhaps, the new normal in some way or another until things drastically change in the industry. My opinion on this is primarily based on how widespread the impacts are, the slow speed at which companies are enhancing their security solution; including data protection, Software Defined Acess strategies. All of this joined with record breaking data breaches, outdated technology, the status quo mindsets, the amount of money profited from stolen data and the silent cyber war of some nation states – is why there are still so many information breaches occurring. It’s time for all of us to hold those accountable that we do business with as well as lobby for change in our government regulations and laws. If we do not and this trend does continue, it will have a much greater impact on goods and services that we utilize and more importantly our personal information and lives. For more information on secure data transfer, download Safe-t's White Paper on Safe-t Box.